I have the most wonderful Dad in the world. I’m sure many of you will have your own candidates for that title, but I have to warn you that I will still think you are wrong. When I was little, my adoring Dad rushed home from work every night to be with me. As I grew older, when my brother was ill, my Mum stayed with him in hospital and my Dad cared for me at home. He manfully learned to do all those little things that Mums often do – including French plaiting my hair for parties. As a teenager, he tried hard to let me be a grown up. He failed miserably of course… but these days I really don’t mind being my Dad’s baby. As an adult, he is always there, not only for me, but for my friends too. 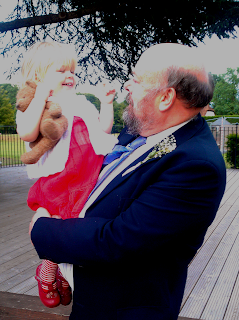 I am so proud that he is the Dad that everyone wants to borrow – no-one could replace my friend’s Dad at her wedding but, in his absence, mine was her first choice to give her away. He is the first person I call when I’m in trouble and the last person to judge me when things go wrong. So it really should rankle that someone has stolen my place in his affections. That when I visit, my Dad’s attention is so often taken by someone else. But it seems he’s a pretty fabulous Grandad too. Happy Fathers Day to all the amazing Dads, including my own Mr. MilkChic – a wonderful, hands-on, caring Dad who is managing to live up to all of my extremely high expectations.